This is an adaptation of problem 1.3 (middle school) from the XIX (1997) Tournament of Towns. Kunihiko Chikaya has pointed out that the same problem in a slightly different notations has been offered in 1987 at the entrace exams at Obihiro University of Agriculture and Veterinary Medicine. This proof is by Amit Itagi. This proof is by Imad Zak. 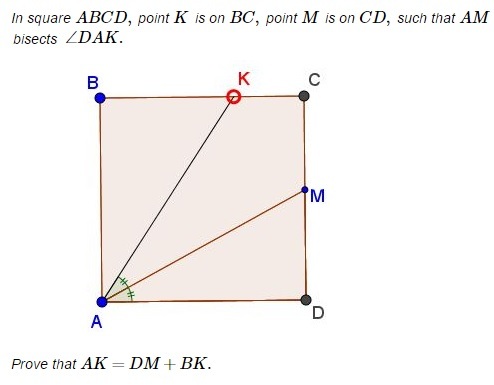 If AM bisects $\angle DAK\,$ in rectangle $ABCD\,$ and $AK=DM+BK\,$ then $ABCD\,$ is a square,rhomb,isosceles trapezoid,square,cyclic.